LOS ANGELES -- American Indian Movement Southern California (AIM So Cal) Chapter is left furious and demanding more, after Gap insufficiently responds to outrage to a MANIFEST DESTINY t-shirt by designer Mark McNairy. 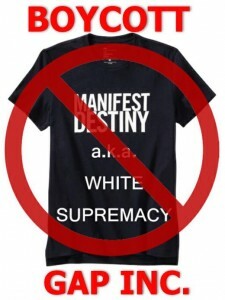 The shirt, black with white capital letters reading “MANIFEST DESTINY,” promotes an ideology that resulted in the mass genocide of indigenous people. The shirt serves to normalize oppression by giving no context for the racism and inequality that persists in our society, to this day, as a result of this doctrine. By selling this shirt, it is implied that Gap Inc. is racist, ignorant, and/or insensitive to the true meaning of the phrase. In reaction to the selling of this shirt, AIM So Cal mass communicated the issue to their network of Natives and allies. A UCLA student created a Change.org petition (link below) that has, within 48 hours, collected over 4,000 signatures, demanding that the shirt be discontinued, and that Gap issue a formal apology. Gap.com has since removed the shirt from online sales, but there is conflicting information between rumors that Gap will remove the shirt from shelves, and first-hand accounts of the product still on sale and display in stores. Gap has not issued a formal apology nor statement, despite rumors of such. Major, local, and independent news outlets assisted in communicating the seriousness of the issue. There are four shirts that Gap currently sells which glorify westward expansion into Native American territory. AIM So Cal has the following demands: 1) Discontinue all four shirts and advertisements with these shirts from online and offline sale and promotion; 2) That all money profited from the sale of the four shirts be donated to the legal defense for political prisoner Leonard Peltier, for his freedom and to bring him home! 3) Fire the designer Mark McNairy, and agree to never contract with this designer in the future; 4) Most importantly, AIM So Cal demands that Gap and McNairy issue a public, formal apology, taking full responsibility for the creation, marketing and sales of these shirts. An AIM So Cal representative will be delivering a letter to Gap on Powell St. in San Francisco, CA with AIM So Cal’s demands on Tues., Oct.16, 2012. For more information on this issue, please contact Corine Fairbanks at (805) 284-4114 or aimsocalifornia@ymail.com. For general information about AIM So Cal, please visit www.aimsocal.org. View the petition link at www.change.org/petitions/gap-discontinue-the-manifest-destiny-tshirt-and-issue-a-formal-apology. High resolution photos are available upon request.